Mergers have been a part of railroading even before the driving of the golden spike in 1869. In recent years, several railroads have started to recognize the importance of paying respect to their past. In this fascinating show, you'll join us as we pay tribute to the fallen flags whose identities were lost after the larger roads merged their systems together. You'll see how each railroad pays tribute. Union Pacific gave the major players from the previous quarter century a unique paint scheme that was applied to half a dozen SD70ACe locomotives. Norfolk Southern painted 10 GE and 10 EMD locomotives from its fleet, each one for a smaller road that merged with it. Amtrak honored its past by painting several P42's in a scheme previously used by Amtrak in its 40-plus year history. Pentrex has gathered a colorful collection of footage of Heritage Units from Amtrak, Union Pacific, and even a few Norfolk Southern units as they visited Southern California. Enjoy scenes along the BNSF Needles and Cajon Subs, as well as UP's Yuma and Mojave Subs, and more. This show includes breathtaking runbys and pacing, passenger specials, manifest and intermodal trains, as well as plenty of narration describing each unit. This exciting show is a must-have for any railfan's collection. 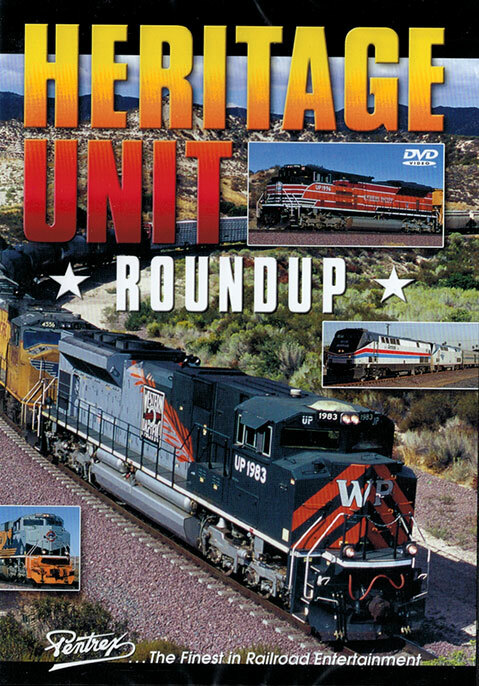 Come join Pentrex in watching each railroad pay tribute in Heritage Unit Roundup! This DVD includes chapter menus and the option of watching the program with or without narration.